How do I save my changes (where is the save button)? When working on a document in hopTo, you can view the document's name in the tab in which it is open. To the left of the name you will see a small letter representing the type of the document: W for Word, X for Excel and P for PowerPoint. If you make changes to the document, or if this document has been newly created, you will notice a small, round green icon to the left of the file name (If it's a newly created document who hasn't been named yet it will say "Untitled Document") with the shape of a small diskette in it. When this green icon is present it means that changes to the document were made and were not saved. This green icon is the save button and tapping it ensures your changes are saved. If the file was not named yet you will be prompted to name the file after tapping the save button. Once all changes are saved the green icon will be replaced with the letter representing the file type as mentioned above, until additional changes are made. Currently it is not possible to save a .docx as a PDF using hopTo. .doc files trigger the "save as" functionality when you hit the save button because hopTo supports only the newer .docx format. Hence, we will allow you to open a .doc but will save it back as a .docx (so subsequent saves do not trigger the "Save as". Please feel free to ask any additional questions. 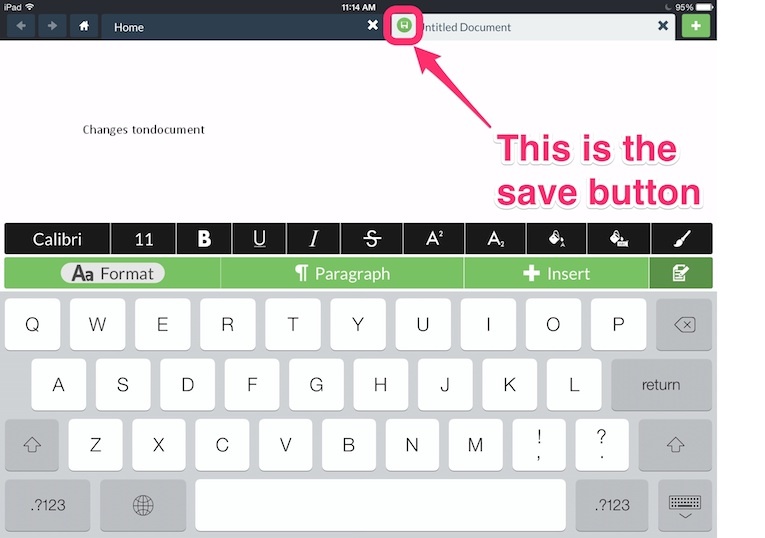 When you open a .doc document, it becomes an Untitled Document, and the green button effectively becomes a "Save as" button. The save is .docx. How can you save a .docx document as a PDF, a standard Word 2010 functionality? The functionality you are referring to is called "Save As" and is not yet available with the hopTo app. It is scheduled to a future update this year. How do you save an edited document with a different/new file name?